July 2012 | What's the Point? Welcome to those of you joining me from Disney Babies Blog and those of you just hopping aboard. I am the fourth stop on our Magical Blogorail. Nestled on Crescent Lake, both Disney's Yacht Club Resort and Disney's Beach Club Resort offer a truly "deluxe" experience. Opened in 1990, these resorts offer a comfortable, laid back Disney experience. 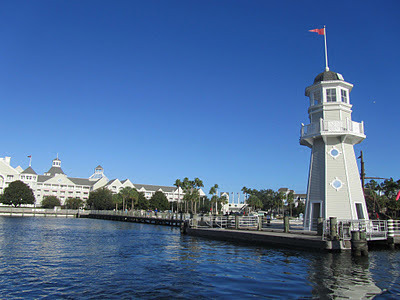 Like all Disney resorts, the Yacht and Beach Club resorts are family friendly and incredibly beautiful. The two twin resorts are located directly across from Disney's Boardwalk Inn and, therefore allow guests to share amenities and experiences. Arguably the best feature of Disney's Yacht and Beach Club resorts are their location. When staying at these resorts you are just a short stroll away from Epcot's World Showcase. The International Gateway is a private entrance into Epcot for resort guests located between the France and England pavilions. Yacht and Beach Club resorts are also close to Disney's Hollywood Studios. So close, in fact, that the Studios are accessible via boat and walkway. The Friendship Boats depart from the Yacht and Beach Club resorts, the Boardwalk Inn and the Walt Disney World Swan and Dolphin. Additionally, there are buses to the Magic Kingdom Park, Disney's Animal Kingdom, water parks and Downtown Disney. Boat dock at Disney's Yacht & Beach Club Resorts. Because of this fabulous location, I highly recommend Disney's Yacht Club and Beach Club resorts for families and adults who are looking for a more casual Disney experience filled with easy access to great food and drinks. You also will have options in regard to balcony view. Some options include standard view, garden view, pool view and lagoon view. Those looking for a higher end experience should opt for the Yacht and Beach Club concierge rooms. 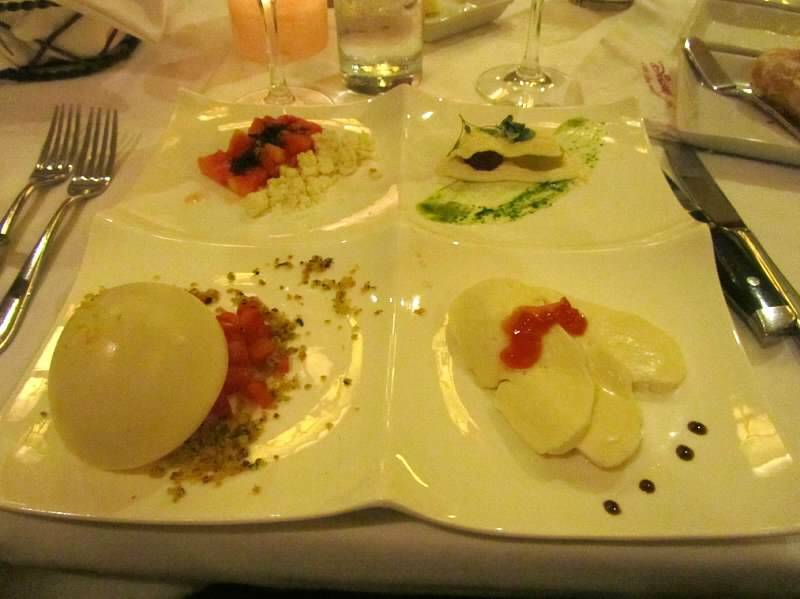 When staying at Disney's Yacht and Beach Club resorts you have many great dining options. My favorite appetizer at the Yacht Club - a take on mozzarella and tomatoes! For breakfast, dine with Goofy, Minnie and Donald dressed for the beach in their bathing suits. In the evening there is a special seafood buffet and clam bake. A laid back nautical themed restaurant for a quick bite. In addition to these restaurants, just a short walk away are the restaurants of the Boardwalk Inn, Walt Disney World Swan and Walt Disney World Dolphin. Stormalong Bay is a massive 750,000 gallon pool with a unique sandy bottom that makes you feel like you are in the ocean without the rip tide or salt water! The pool also has features normally saved for water parks, including a water slide and lazy river. Departing from a ship wrecked boat in between the Yacht and Beach, the water slide is perfect for kids of any age. Both resorts have additional "quiet" pools for guests looking for a quick dip and a little rest and relaxation. Overall I love both the Yacht and Beach Club resorts. They offer fun for the whole family and are incredibly convenient. Thank you for joining me today. 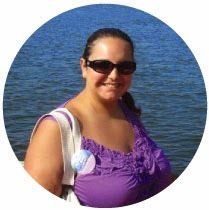 Your next stop on the Magical Blogorail Loop is the CanDoItMOM. Welcome to those of you joining me from The Magical Mouse Pad and those of you just hopping aboard. I am the 4th stop on our Magical Blogorail. If I close my eyes and wish upon a star I can see myself roaming the streets of Paris. In this dream I am eating a croissant and exploring the Louvre. Of course my dream does not end there. My subconscious always plans a stop at Disneyland Paris Resort! Today the fabulous bloggers of Magical Blogorail Black are discussing what attraction, parade or show we would like to see at the US-based Disney parks. However, I am going to change it up a bit. In April of 2008 while I was working in the Disney Public Relations office several of my colleagues attended a special event at Disneyland Paris. It was a grand event with live actors and amazing protection technology. What was it? It was the opening ceremony for the Tower of Terror. Anyone who loyally reads this blog knows how I feel about the Tower of Terror. At Disney's Hollywood Studios the tower is a looming presence. It is a perfectly themed attraction that is all about the infamous Disney show - from the eerie walk down Sunset Boulevard to the attraction exit. I obviously know that I cannot "bring the Grand Opening of the Tower of Terror to US based parks." However what I do know is that I'd like to see more of these shows, events and spectaculars. It helps to build the excitement of an attraction and welcome it to the place that we love oh so much. Most of all, it adds to the grand show that is the Disney Parks. Thank you for joining me today. 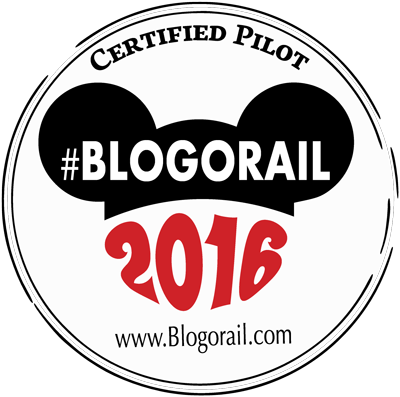 Your next stop on the Magical Blogorail Loop is My Dreams of Disney.